Chatterprint is a concept for a sharable visualization that describes the history of a single person’s online life through a variety of media including like instant messaging, online forums and social networking sites like MySpace and Facebook. By combining a range of different sources, I hope to capture the rhythms and patterns of online life in a way that people feel creates a meaningful self-portrait that they would want to share with others. If the visualization design is successful, I will build a tool that will allow people to create and share their own Chatterprints. Such a tool would let me explore a variety of research questions about the nature and design of sharable visualizations. This is a work in progress and this page contains a variety of thoughts, sketches, and links to related project resources. December 2, 2006 Similar Work "In the Wild"
Fernanda Viegas's work, particularly Themail and other projects described in her thesis. In her studies, she frequently describes her participants wanting to share the visualizations created by her tools. Also, her comments here. Chatterprint attempts to address these ideas directly. Carlis and Konstan's work with spirals in Interactive Visualizations of Periodic Data (citation) pointed me towards spirals as a form to play with. Various forum status indicators (eg or ) that show the duration and type of a person's involvement with a particular community. These are a sort of one-dimensional Chatterprint. Edward Tufte's sparklines got me thinking about other effective ways of communicating relative changes in value. 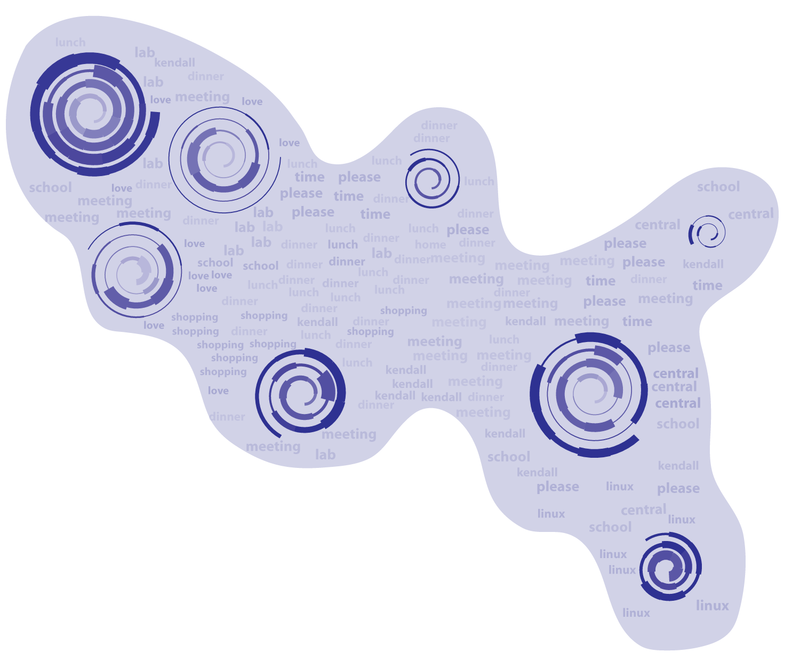 In some ways, the spirals in Chatterprint are a way of making expressive and personal sparklines for different aspects of someone's online life. To really take advantage of the spiral form, I need to explore more interesting permutations than just changing line width. I also need to do a proof of concept investigation of methods of determining similarity between bodies of text. The most recent design is pretty monochromatic - future designs should make more effective use of color. If you have any questions/comments/suggestions/critiques, please feel free to get in touch. I can be reached at dharry at media . mit . edu.